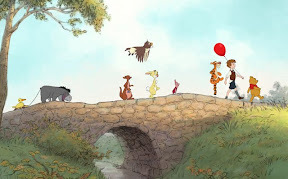 As our new Pooh series narrator John Cleese informs us, Christopher Robin not only possesses a very active imagination but he also has an uncanny ability to collect things, including the charming and eccentric cast of stuffed animal characters that audiences treasure right along with Christopher Robin as well. 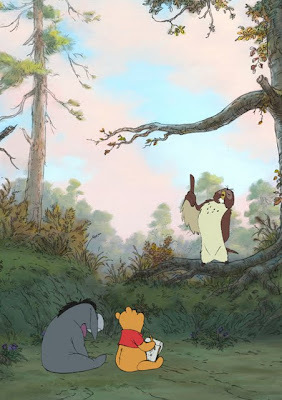 But when pieces of his favorite collection go missing, Christopher and Pooh know that there’s no better person to turn to than their friend Owl given his talent for telling the rest of Hundred Acre Wood’s lovable residents what to do. 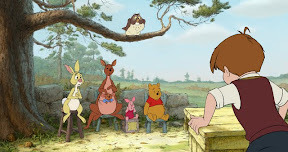 Offering a pot of delicious honey as a reward to the individual that’s first to succeed in locating Eeyrore’s missing tail or finding a promising replacement, Owl inspires the group to begin dividing into search parties with the ultimate goal of tracking down an appendage worthy of being used to pin the tail on the donkey. 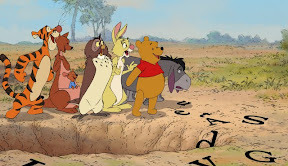 And when the first adventure spirals off into a second one, imaginations go into overdrive after Christopher Robin’s hastily written note sends Rabbit into a paranoid frenzy, enlisting others – on the strength of what may be a simple spelling error and misunderstanding -- to set a trap to catch a mysterious creature suspected of kidnapping their poor human pal. 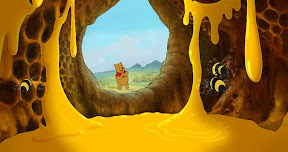 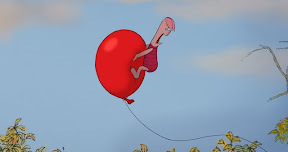 A refreshingly wholesome – not to mention thoroughly un-cynical animated work free of trendy pop culture references and enough sneaked-in double entendres to keep the parents awake – Winnie the Pooh serves as a high-quality, palette cleansing antidote to 3D overload children’s fare. 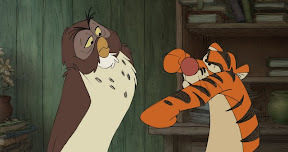 Yes, some of the new character voices may take some getting used to, particularly in the case of Tigger, who is not only saddled with a different rhythm but an uncharacteristic lack of charm as well, coming across as a hyper child with a millisecond-long attention span instead of the jumping, laughing Tigger we all remember. 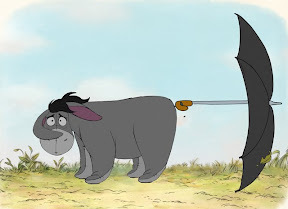 Nonetheless, the new Disney film remains impressive and fortunately, it’s fairly easy to overlook a few out-of-place annoyances due to the swift pace and emphasis on ensemble storytelling. 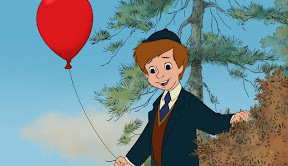 And although Zooey Deschanel’s soothing Judy Garland-esque sunny vocals shine sublimely well in the high definition Blu-ray’s 5.1 surround sound audio field, overall the traditional artistic framing of scenes with hand drawn sketches make the DVD version roughly on par with the HD disc available in the money saving combo pack. 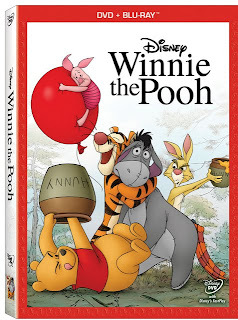 But while it’s hard to justify the extra expense for the Blu-ray format only with the realization that Pooh clocks in with an extremely succinct running time of just 62 minutes, the thoroughly enjoyable picture is ideally suited for the small screen, offering enthusiastic parents and caregivers a terrific opportunity to introduce the silly and sensitive bear to young audience members of a new generation.